Had a very productive weekend. I finished two quilt tops.Mosaic 1 , a variation of a Yarra Design pattern, was started on the 18th April on a flight to Europe. The blocks are all hand pieced, the sashing is machine pieced. Mosaic 2 was started on a weekend away with my quilting friends in late March. It is my design and this time the entire quilt top is hand pieced. I went to a talk by Kaffe Fassett , mid February at Cutting Cloth in Fairfield, he inspired me to step out of my comfort zone and use big, bold prints. 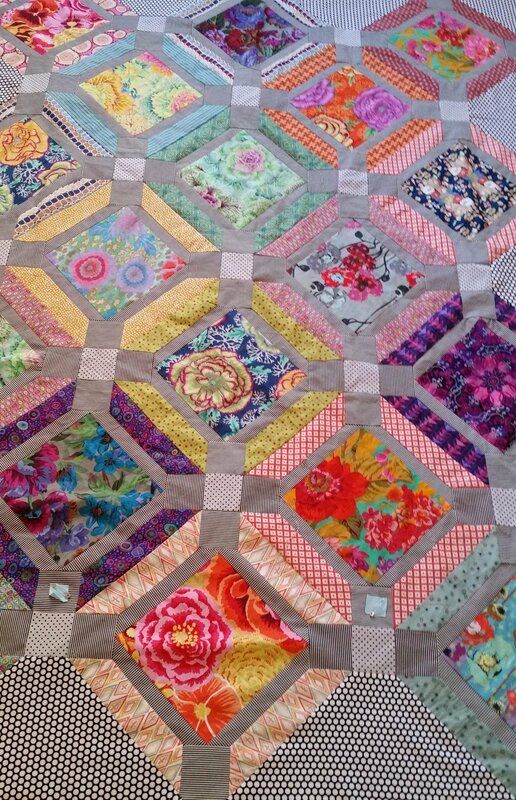 I also learnt that Kaffe hand pieces all his quilts so I have done the same. I must admit hand piecing is very relaxing even if it does cause a flair up of an old hand issue. I am looking forward to quilting both of these in the near future.